The prospectus for entrance examination to Himachal Pradesh University MBA programs (HPU MAT 2017) has been released by the Himachal Pradesh University Business School, Shimla. It is the for the first time that candidates have been given an option to fill-up the application form online. This functionality would serve to be a boon for those students who are presently out of Himachal Pradesh and wish to apply for HPU MAT. Procuring a physical copy of the prospectus from the University Business School office has always been a tough task for outsiders. understanding the need of the hour, taking a step towards realization of Digital India, HPUBS has taken this milestone decision. HPU MBA is one of the most sought after professional courses in the state of Himachal Pradesh given its highly subsidized fee structure for meritorious students, “A” grade accreditation by NAAC, state-of-the-art infrastructure facilities and good placement record. In March 2017, Himachal Pradesh University Business School has also been awarded the ‘Most Promising B-School North India‘ at Asia Education Summit & Awards, New Delhi. Prof. Shyam Lal Kaushal, Director of HP University Business School, Shimla received the award on behalf of the institution from Mr. Upender Singh Kushwaha, Minister of State, Ministry of Human Resource Development, Government of India at Hotel Hyatt, New Delhi on 9th March 2017. 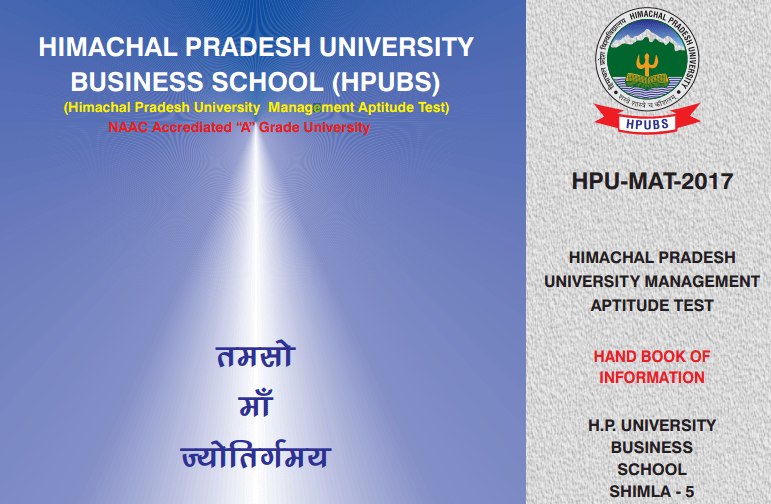 Admissions to HP University Business School, Shimla are based on HPU MAT (Himachal Pradesh University Management Aptitude Test) held each year in the month of May-June at different examination centers throughout Himachal.